Low Tack: Removable / Temporary Fixing, Credit Cards to Letters. 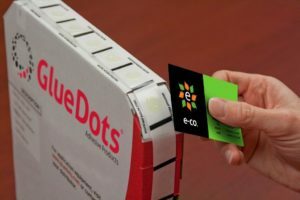 Glue dots are used for bonding CD’s, membership cards, credit cards, sachets to food packaging, and promotional items to magazines, programmes and cartons. Protective packaging, Print finishers, contract packers, Mail Fulfilment, Electronics, Product assembly, Rosettes, Schools and Collages, Greeting card assembly, Food product labelling, Security, Small component assembly and Art and Crafts. These are more than a simple dot! Prices are plus VAT, delivery cost may apply, offer starts Thursday 1st March and ends 30th April 2018. Offer applies only to the 8000 dot pack of glue dots, available in all 3 tack levels, Low, High and Super High Tack.